This year on the 18th of June, when the Moon, a slim crescent, first became visible, a marvellous phenomenon was seen by several men who were watching it. Suddenly, the upper horn of the crescent was split in two. From the mid point of the division, a flaming torch sprang up, spewing out over a considerable distance fire, hot coals and sparks. The body of the Moon which was below, writhed like a wounded snake. This happened a dozen times or more, and when the Moon returned to normal, the whole crescent took on a blackish appearance. This account has puzzled modern astronomers – some suggest that the monks saw an asteroid crashing into the moon, while others believe that it was a meteorite that had entered the Earth’s atmosphere at just the right spot – between the monks and the moon – making the observers believe that what they saw was happening on the moon. For the monks who saw this phenomenon this event would be very worrying indeed. 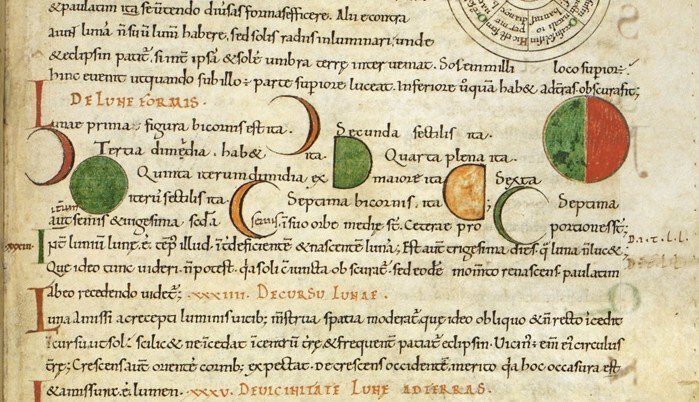 For medieval people the moon was an ever-present, fascinating and mysterious object. The moon not only brought light to the night sky, but it also marked the passage of time and could determine the personality of man or woman. By the beginning of the Middle Ages there were already many theories about the moon, which actually was considered to be a planet like Mercury, Mars, Jupiter and even the Sun. Like these other planets, the moon revolved around the Earth in a perfect circle. Medieval thinkers still had a lot of other questions to answer about the moon – What was it made of? What was the distance between it and the earth? Where did it get its light from? Why were there light and dark spots on its surface? Diagrams of the sun and moon orbiting the earth, with the sun casting shadows upon the other two. If one were to carefully observe and consider the surface markings, one finds them to be of constant disposition, revealing no changes in themselves, neither in their form, their position and size, nor in their respective types of darkness. Superstitious men, and those who should not be taken seriously, have proposed their own, divergent opinions on the matter. Certain people hold the spots belong the lunar body itself; others believe that they exist apart from it, namely between the lunar body and the eye of the observer; still others conceive that they offer an inverted image [of the Earth], since the lunar surface is smooth and reflecting. Ibn-Haytham disagreed with all these ideas and proposed that parts of the surface of the moon were denser than others, which made them reflect more or less light. Someone reading medieval astronomical works will find them tedious and difficult to understand. Moreover, in most cases they were wrong. For instance, the 13th century English friar Roger Bacon understood that the moon caused the tides in oceans, but he believed this was because the rays of light from the moon “raise vapours” from the sea, which cause the waters to move. When the moon was overheard, these rays evaporated the water, which made the tide recede. There are those who claim and affirm that an enormous outpouring of the ocean takes place in all the streams of every region and land at one and the same time. But we who live at various places along the coastline of the British Sea know that where the tide begins to run in one place, it will start to ebb at another at the same time. Hence it appears to some that the wave, while retreating from one place, is coming back somewhere else; then leaving behind the territory where it was, it swiftly seeks again the region where it first began. if it is male, will be virtuous and loyal, courageous and steadfast. He will be physically health and live long. But if it is a female, she will be virile, quarrelsome and vindictive, but honest nevertheless. At times, though not very often, she suffers from some mild infirmity. She too can live quite long. Diagrams of the path of the Sun and the phases of the moon; from Isidore of Seville, Etymologies, England, last quarter of the 11th century, Royal 6 C. i, f. 30r. By the later Middle Ages astronomers had become proficient at knowing when an eclipse would occur. Christopher Columbus made use of this during his fourth voyage to the New World. In 1504 he and his crew were stranded in Jamaica, and forced to rely on the local indigenous people to supply them with food. After a dispute the natives stopped bringing the food, and Columbus needed a way to convince their leader that he should continue the supplies. He had brought on the voyage a book of astronomical tables, and in it he noticed the date and the time of an upcoming lunar eclipse. Just before the eclipse occurred, he met with the native leader and told him that God was angry with them for not providing the food, and that there would be a sign of his displeasure. The lunar eclipse then occurred, turning the moon red, which frightened the natives. Within minutes they were bringing food supplies back to Columbus and his men. A few other late medieval English stories also have a similar story where the man in the moon was some peasant who gets caught stealing thorns to help him build a hedge (every villager would be responsible for helping build and maintain hedges to keep livestock from roaming into planted fields – and they would place thorns on the hedges so the animals wouldn’t be able to eat that either). A medieval German tale explains there are two people on the moon – a man and a woman. The man has been banished there because he had placed thorns on the path to a church in order to prevent people from going to Sunday mass. Meanwhile, the woman is there because she made butter on Sunday. To add to their punishment the man carries his bundle of thorns on his back, while the woman carries a butter-tub. Another medieval legend says the man in the moon is Cain, who as punishment for the murder of his brother Abel is exiled to the moon with some twigs. Stories involving people travelling to the moon are not very common in the Middle Ages – they became popular by the 17th century – but a few do exist. The Tale of the Bamboo Cutter, a tenth-century Japanese folktale, revolves around a young woman named Kaguya-hime who was sent from the moon to the earth, where she almost marries the Emperor before returning to the capital city of the moon. In Dante’s Divine Comedy, the moon is the outermost sphere of Paradise. When the poet arrives there with his guide Beatrice, he first asks her why are there light and dark spots on the moon, to which she replies by giving a detailed scientific explanation involving optics and rays of light. Before moving on to the other planets, Beatrice reveals that this is the place in Paradise for people who were good but were forced to break their vows, such as nun who was forcibly removed from her convent. Detail of miniature of Dante and Beatrice visiting the inhabitants of the heaven of the moon. On the moon, forgotten ancient crowns metamorphose into tumid bladders, flattery turns into stinking garlands, and human brains become liquid ooze: the world’s objects become allegorical parodies of themselves. The moon, at this point in the episode, offers something other than a mirror image of reality. It reflects back an altered version of it, one that highlights the essential rather than the outward qualities of the objects placed before it. As objects undergo a metamorphosis that reveals their essence, the moon becomes an allegory for the literary text, which also transforms reality as it reflects and reconstructs it. The moon was believed to be cold and moist. It was said to be responsible for making the night air moister, which is why there would be dew on the grass in the early morning. Roger Bacon calculated that if a person walked twenty miles a day, he would reach the moon in fourteen years, seven months and twenty-nine days. In Norse mythology, the moon was known as Máni and he was the brother of Sol, the Sun. They are being chased through the heavens by wolves. The word Monday comes from the Old English term Mōnandæg which means ‘Moon’s Day’. In Latin, this day was called dies Lūnae, which has been transformed into modern French as lundi, in Italian as lunedì and in Spanish as lunes. In a popular medieval fable, a fox lowers himself into a well with a bucket but gets trapped. A wolf comes by and the fox sees in the well, but also sees the reflection of the moon in the water. The fox convinces him that what he is seeing is a piece of cheese in the well, so the wolf uses the second bucket to go down, which lifts the fox’s bucket up, allowing him to escape. This type of story continues to be popular, such in Kitten’s First Full Moon.